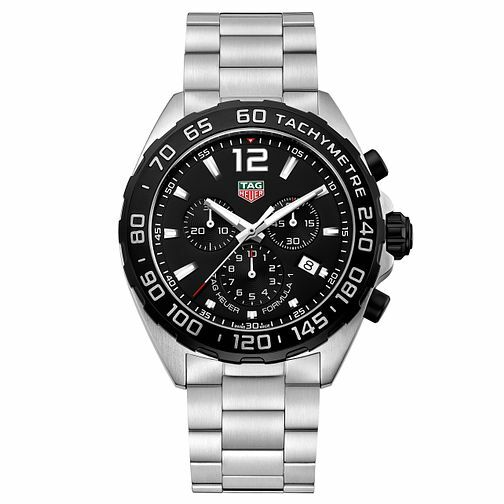 From TAG Heuer's technologically advanced Formula 1 collection, comes this enticing stainless steel bracelet watch with chronograph, black dial and date window, along with a black tachymeter bezel. A bold, sporty timepiece, designed to deliver supreme reliability, inspired by the Mclaren Formula 1 team. TAG Heuer Formula 1 Men's Stainless Steel Bracelet Watch is rated 5.0 out of 5 by 5. Rated 5 out of 5 by Anonymous from Fantastic Watch This watch was a gift for my 30th birthday. I absolutely love it! Keeps time very nicely, and looks great in both casual and work environments. It looks at home whether it's on my wrist rock climbing or if I'm wearing it for a formal occasion. The one negative I found was that after ordering online and having the item delivered to my home address, I contacted my local store (Canterbury) in order to arrange a strap adjustment. I was informed that as they didn't stock TAG watches they would not touch it. I had to drive 45 miles (there and back) to get the strap adjusted to my wrist! Not what I was expecting after spending over £1k on a watch! In summary, fantastic watch that looks stunning. If ordering online just check local store to see if they can do the necessary adjustments! Rated 5 out of 5 by Anonymous from Great timepiece Bought this for hubby 30th birthday and he was very pleased! It looks very nice and match all his outfit, from casual to smart. Would definetely recommend it!